Coach Ernesto Purnsley sees Canming having a great upside. As a first round pick he becomes the choice to replace He Baiyang who was released at seasons end on the Power offensive front. Huang showed good cover ability at the Shanghai combine and could work his way into the defensive backfield. Shi becomes the example for all Chinese players who play the position. 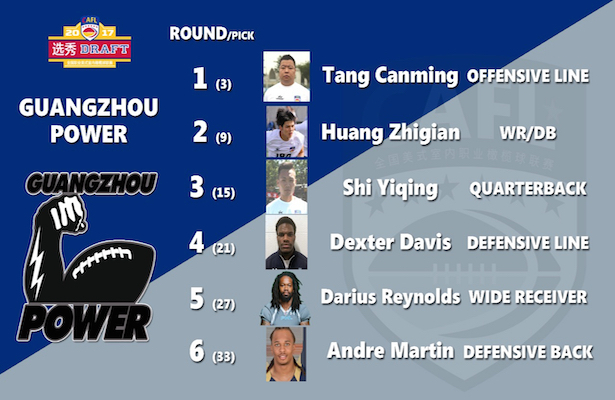 He currently is the only Chinese quarterback in the CAFL. Shi displayed an accurate arm and good footwork at the Beijing combine and now must carry that forward to the next level. Davis has been helping the Baltimore Brigade in its first season in the Arena Football League. He played previously for Portland in the AFL and was a two-time NAIA All-American at Friends College. He should be a good fit bringing 6-4, 230lbs. to the defensive front. With Reynolds credentials he would become one of the top receivers in the CAFL. Currently with the Philadelphia Soul in the AFL, Reynolds is one of the league leading receivers in receptions, touchdowns and yards per catch. Reynolds plays bigger than his 6-2, 205 build as his physical style is a reason why the Soul are the defending Arena Bowl champions. The Iowa State product has six years of professional experience and two AFL championships to his credit. At 5-11, 197 Martin brings his experience to the Power. He played with Portland in the AFL and won a FCS National Championship at North Dakota State.